It is possible to make smaller volume adjustments than what the default volume keys let you do without even going to the volume menu. The shortcut for doing so is holding down "Shift - Option" when pressing on the volume adjustment keys. The shortcut unfortunately doesn't work for other adjustments like brightness. About yesterday's tip, I got a few emails about not being precise enough about how to open that "Get Info" window. 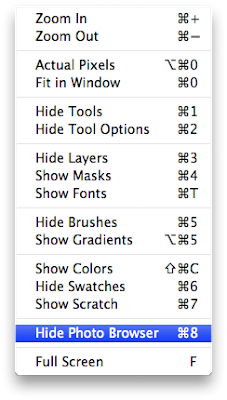 It is in the File menu of the Finder and you can also get it with the shortcut "Command - I". 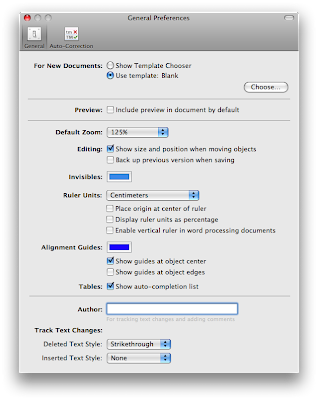 There is a cool checkbox in the "Get Info" dialog of the Finder that easily lets you create a template of any document. It is "Stationery Pad". Once it is enabled and you load that file, it automatically duplicates it and loads the copy. The copies won't have this enabled by default making it perfect for using this with a template. Smart Addresses are enabled by default in Mail and sometimes it is great, but it is not always the best option depending on the situation. Most of my friends in my address book have multiple email addresses and I really like to have both the name and the email displayed so that I know where I am writing. The smart addresses apply both to incoming and outgoing emails. 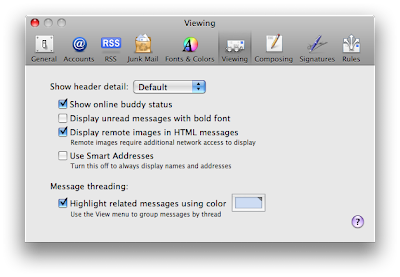 You can turn it on or off in the Viewing tab of Mail preferences. This tip applies to both Leopard and Tiger (even Windows and all other platforms). Adobe released Photoshop Express today. It is an entirely free web application. It lets you do basic photo editing as well as publishing to your own Photoshop Express Gallery (and even to websites such as Facebook). I tried it and it is truly a fantastic web application. The editing options are simple, but if you are used to editing with applications such iPhoto, it is really good. If you get in early, you'll also have the chance of selecting your gallery URL before all the good names are selected. You can learn more and sign up here at www.photoshop.com (select Photoshop Express). This applies only to Leopard. I previously posted a tip that showed how to use the Activity window to download YouTube videos. It works very well, but it doesn't really fit in with how everything works on the Mac. The procedure (converting the downloaded FLV to something readable by the iPod) is just too complicated. A great application called Media Snap makes this whole thing so much easier. You can search for whatever is on YouTube. Once you choose the video you want, it will download it and convert it to a QuickTime format. 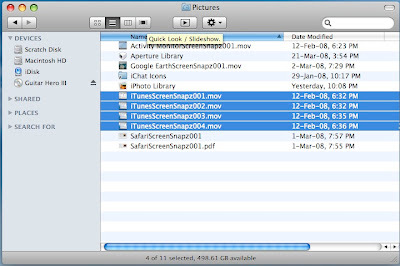 You can learn more about Media Snap or download it here from MacUpdate. 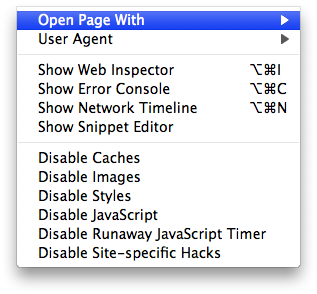 The new Develop menu in Safari! Non destructive editing in Aperture! I know I talk a lot about Aperture right now, but it is because I use it more than ever and I discover a lot of cool tips that way. What makes Aperture stand out compared to many other editing applications such as Photoshop is because it is non destructive editing. What it really means is that the application always keeps the original copy and the adjustments are rendered on the fly as you use the application. It is one of the reason why Aperture is quite demanding in system resources. What I really wanted though was a way of comparing the original pictures with the adjustments made, similar to what you can do in iPhoto with "Shift". The iPhoto Shift trick doesn't work, but there is a button that does the same thing. It is in the lower right corner, the second one from the left. The feature is called "Show Master". You can also get the same feature with the shortcut "M". The Quick Look button can also start a slideshow! 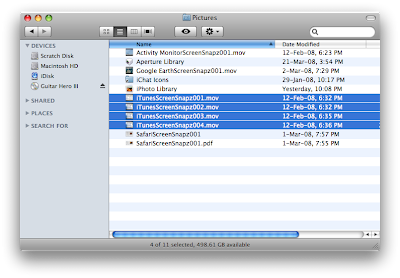 It was already possible to launch a slideshow in the Finder from any list of files. There is an even easier way of doing so however. It is done with the Quick Look button that is there by default in the toolbar. You simple have to select the files, press Option and click on the Quick Look button. When you press Option, the Quick Look button should change from the standard Quick Look button to a play icon. Previously played DVD in DVD Player! 1. Go to DVD Player, and choose Preferences. 2. Click on the "Previously Viewed" tab. 3. 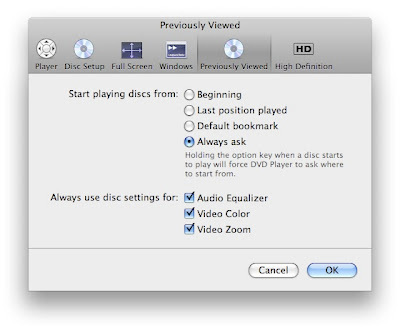 Change "Start playing discs from:" to "Last position played" or whatever option you like. The north in Google Earth! There is one thing that annoys me in Google Earth and it is that as you move around, the north doesn't stay pointing up. I understand why it works the way it does now, but I wish it was possible to a least lock it in place temporarily. Searching online through many discussions about that, I found out that it is possible to make this a non-issue. Every time you want to readjust the north so that it points up, you can easily do it by pressing "N" without any modifier. It doesn't work exactly like locking the north up, but at least it is fast and easy. Wireless backup with Airport Extreme! Yes, it is true, it is now finally possible to wirelessly backup with Time Machine without any Time Capsule. Backing up to an external USB hard drive hooked up to an Airport Extreme Base Station can now easily replace it. It was a feature of Leopard that Apple briefly advertised before pulling any mention of it from the Leopard info. It was unclear until now if Apple was even working on it and the release of Time Capsule only brought further doubts. Finally the "Time Machine and AirPort Updates v1.0" update that Apple released yesterday addressed the issue. As soon as you update your system, you should be able to choose the wireless drive in the Time Machine preferences. There doesn't seem to be much information about if the reliability of the feature improved as any transfer to the wireless drive didn't go well in the past. To be honest, for a while, using the wireless drive with the Airport Extreme reminded me of Back to my Mac (great features that work once out of ten times!). If you are switching to wireless backup, please post about it in the comments with how reliable it is for you. Export RAW from Aperture to Photoshop or Pixelmator! 2. Click on the Export tab. 3. Click Choose in the External Image Editor. 4. Choose the application (Photoshop, Pixelmator or whatever editing application you use). 6. That's it. You can now right-click on any photo, go to "Edit with" and choose the application. It will create a copy in either TIFF or PSD and launch it in the application. You can then do the edit, save it and when you go back to Aperture, the change should appear in the second copy of the picture (the TIFF or PSD file). 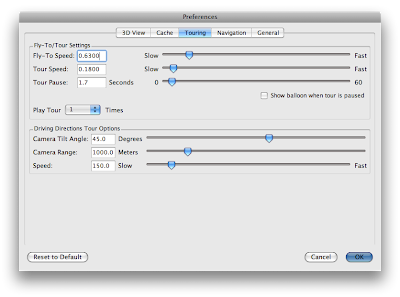 This is truly a huge advantage of Pixelmator over pro applications such as Photoshop CS3. You can easily bring up a Photo Browser, very similar to the one in all iLife applications. It will let you load pictures from your iPhoto library without even having to find them in the Finder. Simply saving them should automatically update the version in iPhoto. 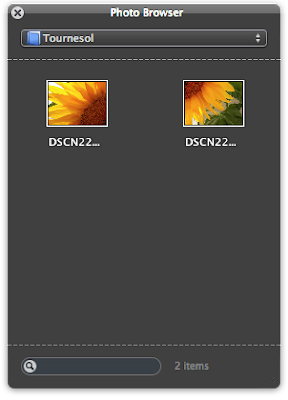 The biggest drawback I have seen is that it doesn't look like it can interact with applications such as Aperture. To get the Photo Browser, simply press "Command - 8" or go to the "View" menu and choose "Show Photo Browser". A future tip will explain how to incorporate applications such as Photoshop and Pixelmator in your Aperture workflow (and to deal with RAW files in these apps). Opening the stack folder instead of the stack! This is for Leopard only. There is a shortcut that lets you quickly open the folder where the stack folder is located in the Finder window instead of opening the stack itself. You simply have to hold down "Command" and click on the Stack. The Finder window will automatically pop up. Unfortunately, it doesn't look like there is a one-click way of opening the stack folder itself (only the folder containing the stack folder). The behavior of an iPod on your Mac! The iPod automatically pauses whatever is playing when you unplug the headphones. 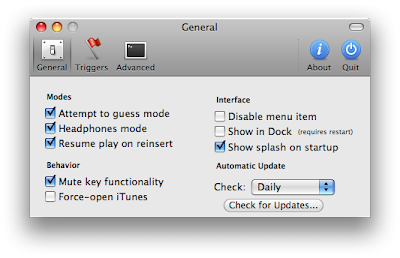 It is possible to get the exact same behavior on your Mac with an application called "Breakaway". Breakaway runs in the background with an icon in the menu bar. By default, as soon as you unplug the headphones, it pauses whatever is playing. You can also set it to pause when you press the mute button. It is also possible to temporarily disable it without actually needing to quit it. You can learn more about Breakaway or download it here from MacUpdate. 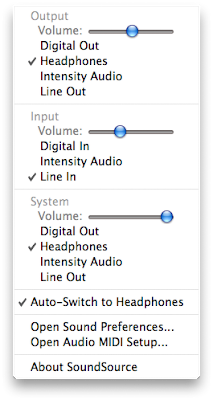 Complete volume control in your menu bar! Working in video and podcasting, I find SoundSource to be nothing more than a necessity. It was just updated to make it even more useful. It is now possible to adjust the volume control right in the SoundSource menu. What is great is that you get separate volume control over Inputs, Outputs and System Sound. Unfortunately, the new volume sliders only work in Leopard. You can download the new version of SoundSource here from MacUpdate. Enhancing the Web 2.0 experience! The great thing is that it is not limited to Safari or even to the Mac. It is cross-platform and it works in IE, Safari and Firefox. Safari is the only browser that will let you use this with the Apple remote. It worked for Facebook in Safari, but I didn't seem to be able to get it working for Flickr. Everything was perfect in Firefox and the interface looked a lot better in Firefox. I would actually recommend using Firefox for this. It looks even better than the dotMac photo galleries. 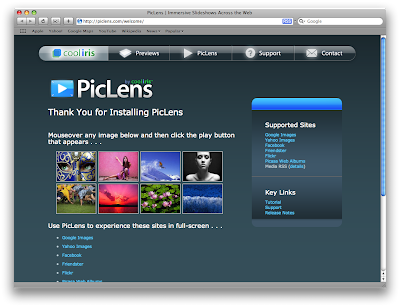 You can learn more about PicLens and download it here from the developer's website. Emailing a link to Google Maps from Address Book! I posted a tip a few days ago about how to bring up Google Maps from Mail or Address Book. That is new to Leopard. There is another feature that can also be very useful in Address Book. 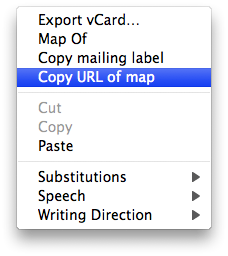 It is called "Copy URL of map". You can get it by right-clicking on an address in Address Book. What this will let you do is copy the URL of the specific location in Google Maps and send it by email or IM without even needing to load it in a web browser. Template chooser or not in Pages! 1. 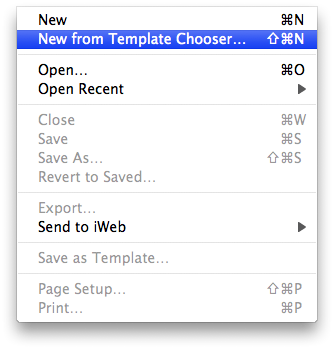 In the General tab of the Pages preferences, switch "For New Documents" to "Use template: Blank". Viewing a few months in iCal! 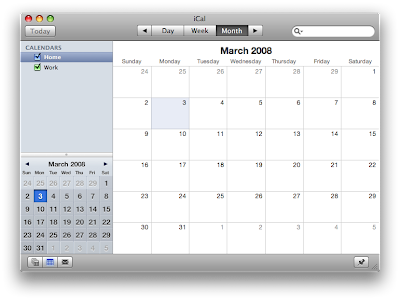 By default, iCal displays a full month in a small calendar in the left sidebar. What is pretty cool is that it is actually possible to expand this section to display one, two, three or more months depending on how big the iCal window is. No matter how many months are displayed, the arrows will still only go forwards or backwards by one month. 1. Press Command-Tab until you are on the application you want to switch too. 2. Without releasing Command, press on Option and then release Command. 3. The window should maximize from the Dock. What doesn't work with this tip is that it won't maximize any window if there is already a window open in this application that is not minimized. It basically works just like clicking on the icon in the Dock of an already open application. Using the scroll wheel in Google Earth! The possibility of controlling Google Earth with the scroll wheel is pretty obvious for zooming in and out. It can do more however. It is possible to rotate the current view. When you hold down "Command" with the scroll wheel, it will rotate the current view. Spaces can be really great when you are working on multiple projects. If you don't know to exactly which space you want to go, F8 (the space shortcut) is usually the most efficient way of finding where is the stuff you want to work on. If you have a lot of applications on top of each other, it might not work as well. That is where you can use Exposé within Spaces. The application specific Exposé (used to be F10) doesn't work there, but the standard Exposé (used to be F9) works perfectly within Spaces! Scrolling up or down in a web browser! The easiest shortcut to scroll down without the mouse in a web browser is the space bar (tested in Safari, Firefox and Camino). One thing that always annoyed me about this shortcut is that I had to resort to the mouse to scroll back up. It is possible to modify it slightly however, and use it to scroll up. The shortcut is "Shift-Space Bar". The only problem about this shortcut is that if the cursor is currently in a text box, it won't work. Adjusting the "Fly to" speed of Google Earth! 1. Go to "Google Earth" and choose "Preferences". 2. Click on the "Touring" tab. 3. Adjust the "Fly-to-Speed" to whatever you prefer, faster or slower. I set it at "0.6300". 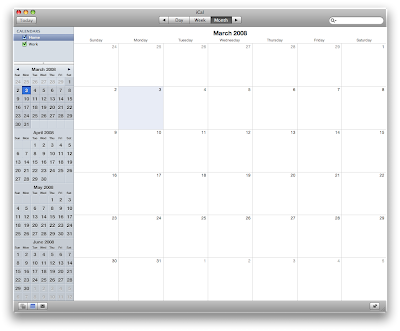 If there is one thing that dotMac does well, it is the synching of Calendars and Bookmarks. When you have multiple Macs, it is great not having to worry where you bookmarked a specific website. dotMac is not for everyone though and it is somewhat expensive for what it offers. If you already have a web server with FTP access, you can sync your bookmarks through this FTP using an application called SafariDepot. It definitely isn't as seamless as dotMac is. You have to choose whether you want to download the bookmarks from the server or upload them to the server. There is also a procedure on the developer's website that lets you automate the process. 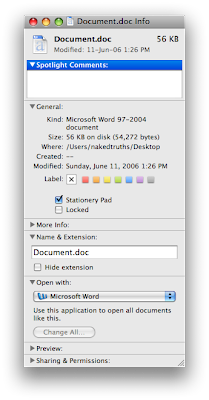 The disadvantages compared to dotMac is that if you modify the bookmarks on both computers, the application won't merge them, you have to choose which file to overwrite. You can learn more about SafariDepot or download it here from the developer's website. There were quite a few comments requesting a widget for my new website Randomly Mac, so here it is. There is also a new version of the widget for A New Mac Tip Every Day that features minor updates. Also available for download is a widget that displays the Mac Tip Every Day feed in a much larger widget developed by a reader of this website, Sean Quinn (Thanks Sean!). Official A New Mac Tip Every Day widget download link. Randomly Mac widget download link. 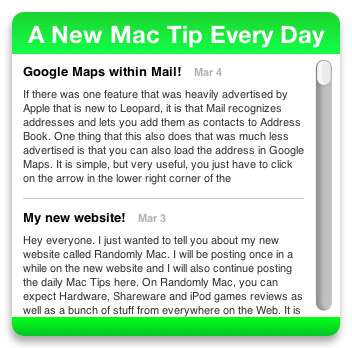 Download link for Sean Quinn's version of the A New Mac Tip Every Day widget. The Apple Remote for NeoOffice! I have to admit that I don't find Front Row and the Apple Remote super useful with portable Macs. When using it to control a presentation, it suddenly makes a lot more sense however. It already works with Apple applications such as Keynote, but for third-party applications, it is another story. A really cool application called NeoRemote enables these possibilities with NeoOffice. NeoOffice is an open source equivalent of Microsoft Office that seamlessly opens Microsoft Office files. The combination of NeoOffice, NeoRemote and the Apple Remote works really well for a presentation. NeoRemote doesn't actually feature a user interface, it just sits in the Dock and lets you use the Apple Remote. You can learn more about NeoRemote or download it here from MacUpdate. If there was one feature that was heavily advertised by Apple that is new to Leopard, it is that Mail recognizes addresses and lets you add them as contacts to Address Book. One thing that this also does that was much less advertised is that you can also load the address in Google Maps. It is simple, but very useful, you just have to click on the arrow in the lower right corner of the recognized address and choose "Show Map...". It will load Google Maps at the right location in Safari! An alarm for MacBook and MacBook Pro! I remember a few years ago when I had to use a separate device as an alarm when I left my laptop unattended for a few minutes. Things have improved a lot since. 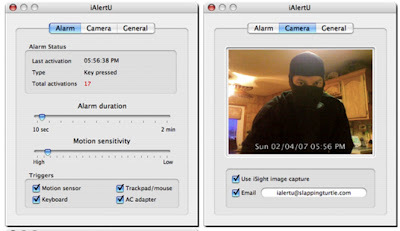 A pretty cool application called iAlertU uses the MacBook or MacBook Pro built-in accelerometer as an alarm. The application is enabled and disabled using the Apple Remote. I assume the application is set with a particular remote, just like the OS, to stop anyone from disabling it with any remote. The application can also use the built-in iSight to take picture when the alarm goes off. You can learn more about iAlertU or download it here from MacUpdate. Converting videos and podcasts to Apple TV, iPod or iPhone! There was a tip a while back about using iSquint to convert videos to iPod/iPhone. It is possible to use iTunes to do something similar however. It avoids the need of using QuickTime Pro and it also adds Apple TV conversion. The great thing about having it directly in iTunes is that you can even convert podcasts that don't work on your device without even getting the files out and importing them back again. 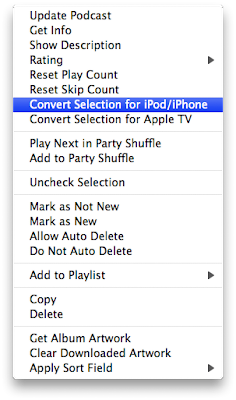 To do the conversion, right-click on the file in iTunes and choose "Convert Selection for iPod/iPhone" or "Convert Selection for Apple TV". Creating a new bookmark folder! This is a quick shortcut that will make creating a bookmark folder easier. In Safari, when you are in the "Show All Bookmarks" section (or by clicking on the open book at the left of the bookmark bar), you can easily create a new bookmark folder by clicking on the "+". You will have to create the folder and afterwards drag all the bookmarks that were already created that you now want in the folder. There is an easier way however. You can do it by first selecting the bookmarks you want in the new folder and holding "Option" when clicking on the "+". All the bookmarks selected will then be automatically added to the new folder you are creating.